Project "Stakeholders’ partnerships in collaborative policymaking: Fostering transboundary cooperation on small watersheds in Central Asia"
Fostering transboundary cooperation on small watersheds in Central Asia"
Today’s water-related problems in Central Asia are not simply rooted in an unequal distribution of water resources, but also have significant historical, political, economic and ecological dimensions. New transboundary approaches are needed. The fully integrated management of water resources, which takes into account the interests of different sectors and ecosystems and applies the water basin principle, is gaining ground but is generally not yet the basis for national and transboundary water policies. In addition, the ongoing national and international development efforts are mostly focused on large transboundary basins and high level political dialogues among Central Asian states. Small transboundary Rivers as a model for large transboundary basins: The suggested project will focus on three transboundary small watersheds in Central Asia to apply the principles of IWRM and to act as an opportunity to establish respective technical- and staff resources to serve as models for large transboundary basins and developing transboundary cooperation based on common trust and understanding. Introduction of Integrated Water Resources Management (IWRM) practices in three small transboundary watersheds and their dissemination in Central Asia. The component on capacity development foresees development of a transboundary information strategy and its implementation; conducting of trainings on IWRM principles and best water management practices; study and demonstration tours to pilot territories. This component includes activities: conducting baseline surveys and needs assessment studies (a review of existing data; socio-economic survey and an assessment of human- and technical capacity at local and national level for water quality monitoring in the selected transboundary watersheds); creating small transboundary basin councils in three small watersheds that will include representatives of local authorities, experts, NGOs, private water users; development of joint transboundary action plans; implementation of three local pilot projects. In this component, the Regional Working Group (RWG) will be established based on the existing RWG that was established within the framework of the UNECE-CAREC project “Water quality in Central Asia”. The RWG will include representatives of ministries of environmental protection, agriculture, water resources, hydrometeorology, and emergency of the Central Asian countries. As part of the regional working group, it is envisaged to develop common approaches for implementation of best practices for efficient land and water; to discuss progress in the pilot areas; involved in selection and implementation of pilot projects. The Aspara river originates in the western Tien Shan ranges on Kyrgyz territory, flows northwards and crosses the Kazakh border after about 10 km. The total length of Aspara river is more than 44 km and its catchment covers an area of approximately 66 km2. High water levels usually occur April to June along with the snow melt including occasional flood events. 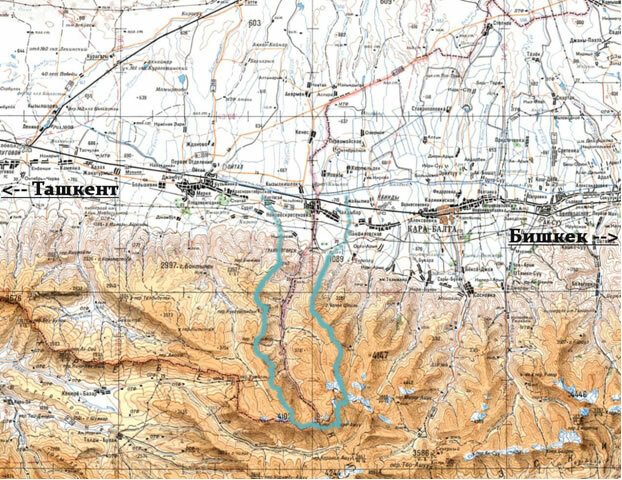 The Aspara river basin belongs to Chu Oblast in the northwest of Kyrgyzstan and to Zhambyl Oblast in southern Kazakhstan. Several different nationalities live and work in the area. The population is growing rapidly and agriculture is increasing. In many localities particularly further downstream, water quality does not meet designated standards and sanitary standards. Waste water from households, industry, livestock as well as solid waste are regarded as main sources of pollution. The project activities will be implemented in the Zhambyl Oblast of Kazakhstan and in the Chu Oblast of Kyrgyzstan. CAREC has a letter of principal interest from the State Committee of Kyrgyz Republic on Water Resources and Land Reclamation to consider projects in Aspara river. The Isfara river basin is located in northern Tajikistan and south-western Kyrgyzstan. 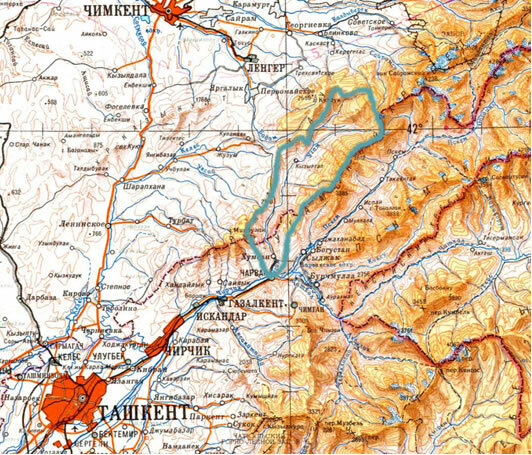 The river originates on the northern slopes of the Turkestan Range at an altitude of 4,500-5,000 m and flows northwards through the Ferghana valley towards the Syrdarya river. 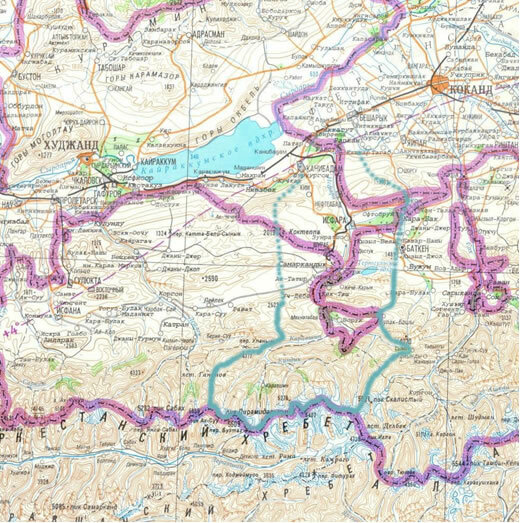 The total length amounts to about 120 km. Due to complete use of its flow for irrigation purposes the Isfara river does not reach the Syrdarya. The Isfara is a snow-glacier fed river. High waters start in the second half of April, and in some years in May and lasts to October. The average annual discharge adds up to 457,3 million m3 and the catchment covers an area of 1,560 km2. The Isfara river basin belongs to Sugdh Oblast in Tajikistan and to Batken Oblast in Kyrgyzstan. About 185,000 people live in the basin. The population of Batken consist of mainly ethnic Kyrgyz, with a large Tajik and a smaller Uzbek minority. Several Tajik and Uzbek enclaves located inside the Kyrgyz Oblast’s territory which has led villages being bisected by the Tajikistan-Kyrgyzstan border and to Kyrgyz ethnic majorities in Tajik villages. The project activities will be implemented near the town Isfara in Tajikistan and in the west of Batken Oblast. Currently, GIZ is implementing a project on Isfara and Khodzha-Bakirgan rivers including a ratification of an Interstate Framework Agreement on transboundary river basin cooperation between Kyrgyzstan and Tajikistan. This agreement can serve as a legal basis for activities of the proposed project, such as creation of a small basin council and development of an IWRM action plan. The Ugam river is a small but important transboundary tributary to Chirchik river, northeast of Tashkent. The length of Ugam river is about 70 km in total with an estimated basin area of 870 km2. The river rises in the Ugam ridge, in the western Tien Shan mountains and crosses the Saigam-Ugam National Park in south Kazakhstan before reaching the border and entering into Uzbekh Chirchik valley in Tashkent region. With an annual runoff of around 1.200 million m3 the Ugam river contributes around 20% to the total runoff of the Chirchik river downstream Charvakskoe reservoir and is a very valuable fresh water resource for the Tashkent region. However, increasing population density and tourism together with intensified agriculture have started to harm the ecological balance of the basin. A decrease in quality and quantity of the available water resources of the Ugam river basin can be observed. The project activities will be implemented on both sides of the border in the Tolebi area of south Kazakhstan and in theTashkent region of Uzbekistan. Recently CAREC has started a pilot project that will develop a Payment for Ecosystem Services scheme for the Sairam-Ugam National Park. A letter of approval (Att.2) from the State Committee for Nature Protection of the Republic of Uzbekistan has been received for the pilot project. The activities of the pilot project can be considered complementary to the proposed project activities introducing IWRM principles at Ugam river basin.